Structural studies of G-rich polynucleotides confirm that conformations adopted by such DNA-fragments are more diverse than previously thought. 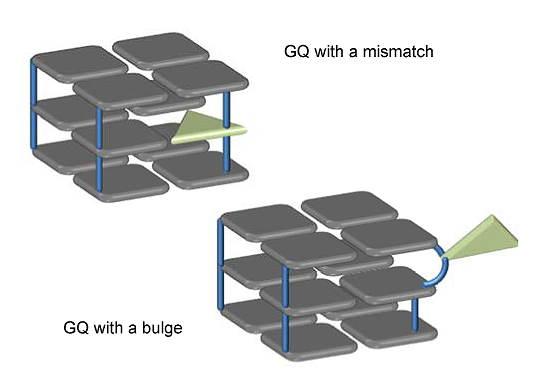 Two recently reported new types of G-quadruplexes (GQs): GQs with bulges [Thachappilly et al. J. Am. Chem. Soc., 2009; 131: 1835-1846] and GQs with mismatches [Martin Tomaško, Michaela Vorlíčková, Janos Sagi. Biochimie, 2009; 91(2): 171–179] appear to be stable under physiological conditions. We developed an improved (broadened) GQ-search algorithm taking into account these new types of GQs in addition to the canonical GQs described by the G3+NL1G3+NL2G3+NL3G3+ formula, which is used in most current GQ-search algorithms. The new tool for GQ search, ImGQFinder is here. Read more about the algorithm and the search tool. In our broadened algorithm, we search for G-runs, determine the distance between them and select fragments which comply with the predetermined conditions for the maximum length of GQ loops and the minimum number of nucleotides in a G-run (i.e., the number of tetrads). ‘Imperfect’ G-runs are defined as Gi-1NGk-1 for GQs with mismatches and Gi-1NGk-i+1 for GQs with bulges, while ‘perfect’ G-runs are Gk. Terminal ‘imperfect’ G-runs are Gi-1NGk-1 for both GQs with bulges and GQs with mismatches. N denotes any mismatching or bulging nucleotide; k is the number of guanosines in a G-run (k>=3); i is the position of a mismatch/bulge in the G-run (1<i<k). The user uploads the sequence of query in raw or fasta format and specifies GQ-search parameters (the maximum loop length, the number of defects and the number of G-tetrads) in the input window. ImGQFinder displays all matching sequences including the overlapping ones. The built-in application allows the user to determine sequences with multiple GQ-forming potential as a single putative GQ fragment (the ‘Add intersected output’ option).